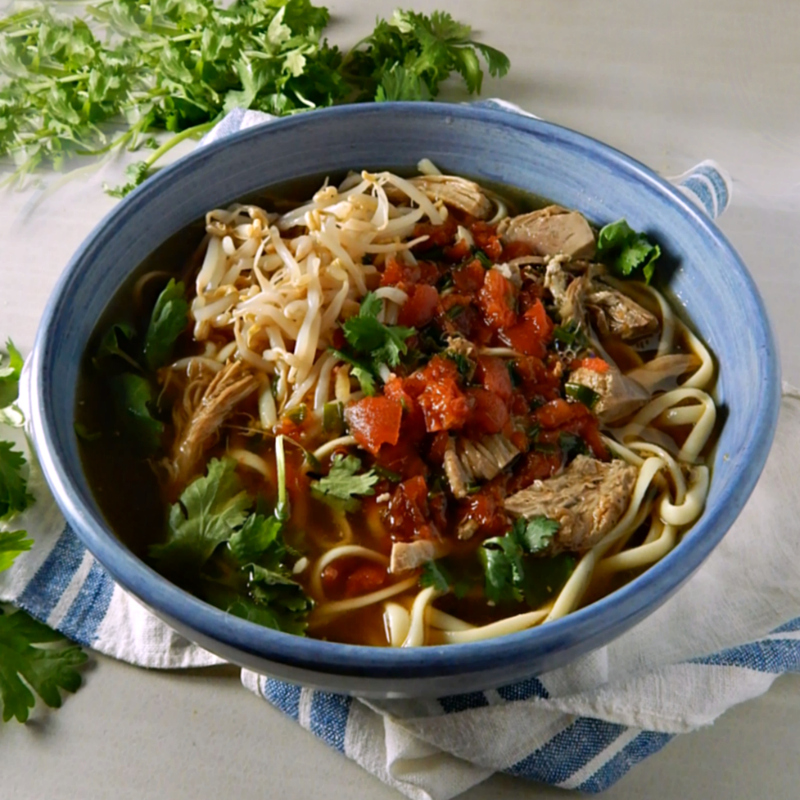 I came across this Vietnamese Pork Noodle Soup on Food & Wine and knew instantly that I wanted to adapt it and make it with my Instant Pot Pulled Pork that I made the other day (any pulled pork will work, but it is going to be best without any barbecue sauce) along with the juices from that pulled pork to boost the flavors. You can use just chicken, beef, pork or a vegetarian broth if that’s what you have on hand. I’m loving this soup and it is going to be a standby anytime I have pulled pork! First off, let’s talk about those flavors, and why I knew a marriage of our Southern standby, pulled pork, would work so well with the Vietnamese flavors of this soup. It all goes back to the rub I used on the pulled pork, my Essential Rib Rub. The rub has a little brown sugar, a great stand-in for the rock sugar in Pho, so I thought it would work well here. It has a little chile and a little cayenne and black pepper along with white pepper, common to many Asian cuisines. And you can’t go wrong with the onion and garlic, although the mustard powder is an outlier as a flavor, there’s not enough to skew it. So essentially, starting out with the broth and the pulled pork from the Instant Pot Pulled Pork in this Vietnamese soup seemed a perfect blend of flavors, especially when you stop and think about how many soups like this are served with a little chili garlic sauce, anyway. That leftover broth from cooking the Instant Pot Pulled Pork is rich and thick and full of collagen. It’s essentially bone broth. I did quite a bit of researching to try to figure out where or how the Food & Wine Vietnamese Pork Noodle Soup might fit into the hierarchy of Vietnamese Soups. My guess is it might be based off on Hu Tieu, without the seafood. I’ll have to explore a more traditional version sometime! In the meantime, I’m head over heels about this Vietnamese Pork Noodle Soup. Maybe if you’re a Vietnamese visitor, you might chime in and let me know if you’ve ever heard of a soup like this…maybe with a more traditional noodle than linguine? My Instant Pot Pulled Pork let behind about 3 cups of broth. This soup could really not be simpler, especially starting out with the Instant Pot Pulled Pork and those beautiful juices! It was seriously on the table in under 20 minutes and the only reason it took that long was the noodles had to cook! And yet, it tasted like it had simmered away all day. If you don’t have pulled pork, click the Food & Wine link and try it with a little pork tenderloin like they did. I think, either way, you’re going to fall in love with this Vietnamese Pork Noodle Soup, too. I’d suggest adding a little chile garlic sauce if you’re not starting with the pulled pork. Heck, maybe you want to add it anyway! Just a note on the broth: while this soup can be made with just about any broth, when using the broth left from the Instant Pot Pulled Pork, taste it. It is incredibly rich and you might want to cut it with water rather than mixing it with any additional broth to get your 6 cups worth for the soup. Vietnamese Pork Noodle Soup is dirt cheap to make, especially since the pork shoulder is so inexpensive to start with. An additional savings is starting the soup with the broth from the Instant Pot Pork Shoulder because a good boxed broth can put you back a bit. I do make a lot of my own chicken stock but since I cook a lot, sometimes I have to rely on the boxed or canned stocks. They can be pricey, and it is worthwhile to really stock up on them at a low. I’ve never seen them go for less than they do around winter holidays, specifically Thanksgiving and Christmas. Other pantry items like the tomatoes (if you use canned) and the pasta are also worthwhile stocking up at when you see them at a low. These basic pantry items are some of the few things that I buy on sale with coupons. As far as the Asian ingredients, if you do have an Asian market, shop there. You may very well be surprised at how inexpensive ingredients are. Sometimes, not often, I’ll see sales at my regular grocery store, usually during the Lunar New Year. This simple soup with complex flavors starts out with Pulled Pork. This has to be the best “fusion” ever! And no, it’s NOT Pho! 8 cups canned low-sodium chicken broth or homemade stock or a combination of the juices from pulled pork and any of the previous options to make six cups. In a large pot of boiling, salted water, cook the linguine until just done, about 12 minutes. Drain the pasta. Rinse with cold water and drain thoroughly but keep warm. Meanwhile, in another large pot, heat the oil over moderate heat. Add the scallions, and ginger and cook, stirring occasionally, for 2 minutes. Add the tomatoes, pork, and broth along with the fish sauce. Bring to a boil, reduce the heat and simmer several minutes until the pork has heated through and flavors blend, about five to six minutes. Turn off heat and add lime juice. Taste and adjust seasonings, adding salt if needed. To serve, place a serving of noodles and bean sprouts in each of 4 bowls. Ladle the hot broth over. Top each serving with herbs, and serve with the lime wedges. I’ll be linking Instant Pot Pulled Pork at Fiesta Friday number 225, hosted this week by Antonia @ Zoale.com. Your dishes look absolutely tasty! I look forward to following your recipes! Beautiful bowl of soup Mollie! And you are really getting so much use out of your Instant Pot!! I’m up at my daughter’s house in SF and she uses hers to make oatmeal most mornings– but the soup!!! And so smart to use the pulled pork!! You get two really varied meals from one pork roast. You are so clever! hugs! I need to use mine for oatmeal! It’s so healthy and I just never think of it. And i have some nice steel cut ones. I really loved the soup! I’ll be by to visit soon! And to see the pancakes. It’s been crazy, here! Hey Mollie– that’s what she uses– Bob;s Redmill steel cut oats. Better than my mushy oatmeal at home! Enjoy your crazy days– at least you’re never bored!! hugs hugs! I never had oatmeal growing up except for at camp, and I loved it. It was all sticky and clumpy and sweet, lol!! Just how it’s NOT supposed to be! Course, now I’m a little more sophisticated but if I could make “camp” oatmeal, I’d be happy!! Thanks Petra – I can see myself spinning off so many variations, too. I just need a bowl of this hearty soup, I’m suddenly starving! Hi Chef, I appreciate it!! A gorgeous bowl of soup, Mollie! I love recipes like this! It does look similar to pho. Thank you for bringing your soup to the party! Happy Fiesta Friday! Antonia, thank you for hosting! And I’m a bad party goer – I haven’t been by your blog yet!! That sounds so good! Would be perfect for tonight. After a scorching day yesterday, it’s now in upper 50s! Noodle soup would be perfect! I am so jealous of your 50’s, you have NO idea!! The soup is so light, though, I could eat it anytime. I think it’s one the favorite things I’ve made lately. I dunno, they’re all faves, but you know what I mean!! I will teach you, np!! Tweety this is SO good. We have to start with the pork shoulder, though and that’s always a great recipe to do! I am sure you’ll love it!! 🙂 See, there’s me getting all cocky but it IS really good! We decided to make it tonight but I used chicken instead. Do you mind if I tag u in a post about me doing the recipe? Brilliant! And thanks I would LOVE to see it! !